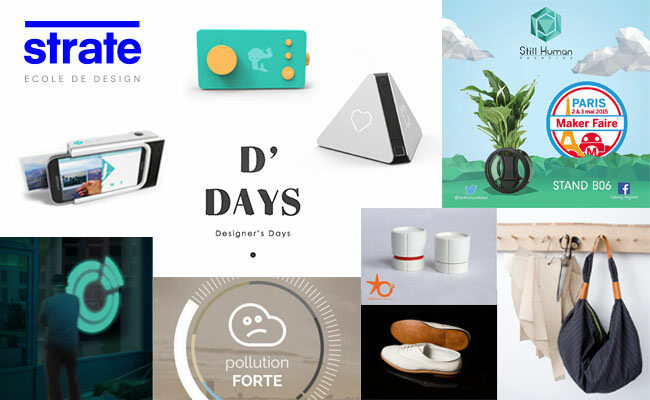 What can better illustrate the mission and the success of a design school than allowing its young graduates to show how they create their own company and invent the future by imagining new experiences, new services and new products? Lunii is a modern narrator of imaginative tales for children from three to seven years old. This story maker was Maëlle Chassard 2013 diploma project. Glowee was born from the Artscience Prize, an educational and cross-disciplinary project with other international schools, coordinated by Strate since 2015 and in partnership with David Edwards’ Le Laboratoire. Then, Maëlle Chassard and Sandra Rey partnered with biologist Victoria Biro in order to further develop the project. They just won one of the Echappée volée 2015 awards and went on TV for coverage during the 8pm news broadcasting on TF1. After a powerful fund raising on Kickstarter, which turned the startup into "the most successful French kickstarter campaign", Prynt is currently under development. This startup is composed of stratos Robin Barata (2012 cohort) for the design and 2 alumni from Ecole Polytechnique. Adapting music according to the environment. Prizm is a music player that determines the music to play according to the atmosphere of the room. Pierre Verdu (2012 cohort) is part of this beautiful adventure. Ga.ia, what if plants had legs. Still human is the startup of Matthias SCHMITT (2014 cohort) aiming at developing his diploma project (Ga.ia). BFMTV Talents du Numérique 2015 (Digital talents) liked Matthias’ project. Design agency founded by Coralie Frick, Arnaud Le Cat and Esther Bacot (2009 cohort). INQUI presented their projects, including the bag “You can sleep in the barn”. This is the development of Coralie Frick’s diploma project and it is commercialized. Plume Labs develops ways to capture pollution. Ryslaine Mouley (2014 cohort) joined this startup and developed the existing mobile phone application. In the future, she shall take care of the sensors development, a subject she knows well since it is one of the components of her diploma project.